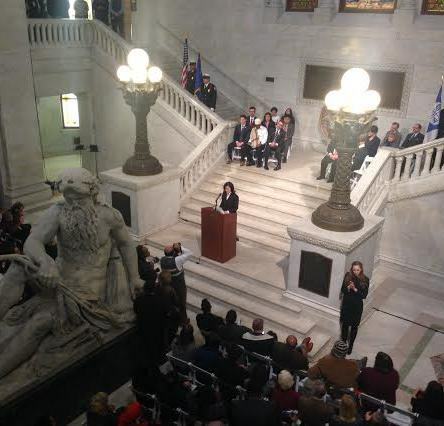 A new era of leadership in Minneapolis began Monday morning with the inauguration of a new mayor and seven new City Council members at City Hall. The new members comprise a majority of the 13-person body, which controls city property taxes, spending and local ordinances. In her inaugural address, new mayor Betsy Hodges said her chief goal will be to ensure that both white people and people of color thrive in Minneapolis. “When we get that right, we will become a beacon for the entire country,” Hodges told a crowd packed into building's rotunda. The former budget chair said that the city must be careful in its fiscal decisions as the economy improves. Hodges also stressed her goal of growing the city’s population to 500,000 – it is currently about 392,000. "We were sent here by the people of Minneapolis to grow our city," Hodges said. "To grow our city, and make it more than great, means above all that we must grow a population where 500,000 people — no, 500,001 and more people — live and thrive in Minneapolis, with the greatest density along transit corridors. That goal is ambitious, and it is critical to our success." "Now the campaign is over and the governing begins,” Sen. Scott Dibble told a packed crowd in the building’s rotunda. The new council members are: Andrew Johnson, Alondra Cano, Abdi Warsame, Blong Yang, Lisa Bender, Jacob Frey and Linea Palmisano. They represent wards in South Minneapolis, Uptown, the central riverfront and the North Side. Their first action at their first meeting – following the inauguration – will be to elect a council president. This is expected to be current president Barb Johnson, who said recently she had lined up the votes necessary to retain her title. Activists are planning to rally at City Hall with demands to “prioritize the need of all Minneapolis’ diverse communities over the corporate interests of the richest 1%,” according to a news release.